Zoomylicious: You're killin' me, Old Man Winter! You're killin' me, Old Man Winter! 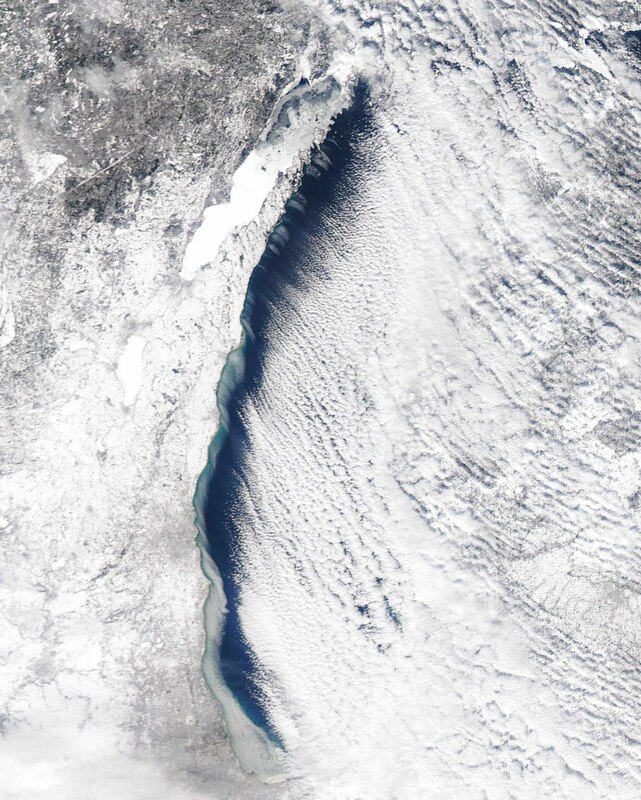 That's a satellite image from just a day or two ago that shows the snow and ice cover in the Lake MI region. 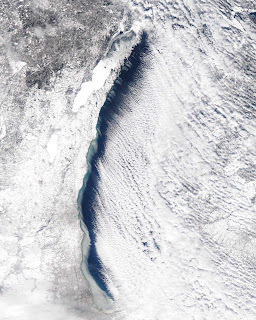 Notice how the Green Bay is nearly frozen solid all the way across. It's gotta be pretty cold for an extended period for this to happen. We're on the other side of Lake MI, on the western side of lower Michigan. Between the cold (windchill figures in the negatives or single-digits), snow, and dreary skies I have lost ALL MOJO. I quit. I didn't run outdoors yesterday and today I am hitting the nowhere bike. Tomorrow I *should* go run outside, but the current weather pattern is looking like it's going to hold steady through the weekend. Meh. I would KILL for just a few days above freezing. Running on snow and ice have started to take a real physical toll on my body. After a week or two of bad roads I always seem to find my knees complaining, along with my hips and lower-back. That unstable running surface just really beats me up. And I'm not fond of the mountains of laundry, either. A single run requires heavy tights, warm top, windbreaker, hat, gloves, wool socks, and snot rag. This is part of what's keeping me indoors on days when the windchill is in the single digits or lower. Adding windbreaker pants and Buff or balaclava to the mix is a bit of a deal-breaker for me. Every run seems to require a FULL load of laundry. This has gotten old. Plus the cars that WILL NOT GIVE ME ROOM. I can't run on the shoulder, since the shoulder is now a 2-3' deep snowbank. Folks, you gotta move the heck over...I don't want to play chicken with your side-view mirror, OK?! And the roads are slippery. Even the drivers who DO give me room make me nervous. Yesterday DS had a half day of school for teacher inservice. In the 20 miles between our community and his school (he attends a public charter Montessori academy down near DH's work) I saw EIGHT cars in the ditch. I have awesome snow tires on my car and my ABS still kicked-in when I had to brake for a pack of slowing cars ahead of me on the interstate (the interstate that actually is plowed and salted, unlike the backroads that I run). I was terrified that the cars coming up fast on my rear would collide with me--my car is relatively small and lightweight and can stop a lot faster than these larger vehicles can, especially since most of them are likely rolling with average all-season rubber on their wheels. An early Spring would be nice. The snow is no longer pretty, it's just a menace that has overstayed its welcome. The "weiner" of Lake Michigan has experienced shrinkage! I'm ready for a temperature above 20, TYVM. Ha! Yeah, I'm happy that the temps are going back up to "normal" for a few days. But it's definitely time for Spring, IMO.